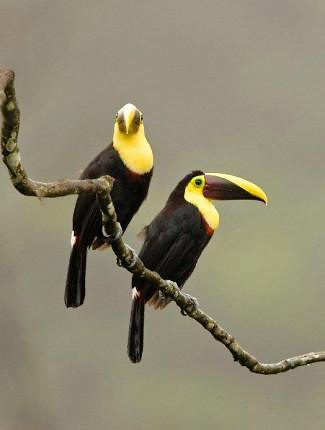 Chestnut-mandibled Toucans by David Sewell. In mid-February 2019 there were two known Harpy Eagle nests and a Crested Eagle nest all with chicks about four to five months old near Canopy Camp in The Darien. Parent birds, especially females, are usually regular visitors to the nest when there are young in or near the nest and fledged juveniles normally remain close to nests for up to a year so there is a very good chance of seeing Harpy and Crested Eagles on a visit to this region of Panama in 2019. The Harpy Eagle nests take around two hours to reach on foot while the Crested Eagle nest is only a 15-minute walk from the camp. In addition to the birds mentioned above two to three million raptors pass over Panama City from late September to mid-November. Over three million were recorded during the 2013 season (the best total since coordinated counts began in 2004) and over two million (2,105,060) were counted on a single day in 2014, the 2nd of November, over double the previous day record of 900,000 or so in 2013. Most of the birds involved are Mississippi Kites (mostly early October), Broad-winged (mostly mid-October) and Swainson's (mostly late October) Hawks, and Turkey Vultures, and the greatest numbers can be seen over Cerro Ancon. Other raptors include (American) Swallow-tailed Kites (over a hundred on 4th of October 2010) and Zone-tailed Hawks, which may also be seen migrating from Canopy Tower and the Panama Rainforest Discovery Center near Pipeline Road in Soberania NP (see below). Counts are kept by Audubon Panama. 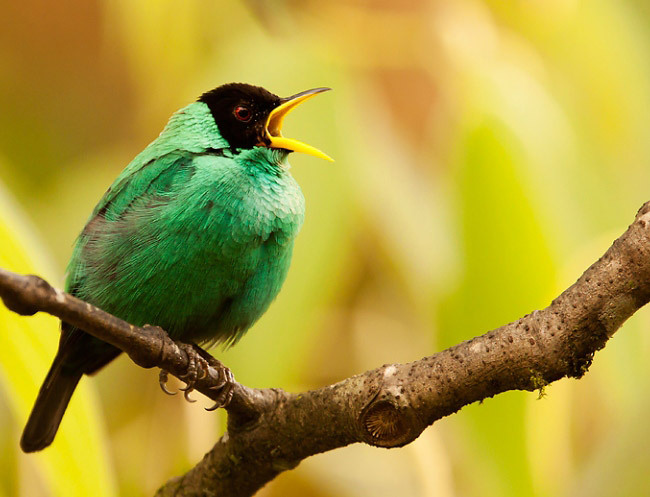 Green Honeycreeper, one of the many fabulous birds in Panama, by Dubi Shapiro. Brown-backed (Azuero) Dove, White-throated Mountaingem, Glow-throated Hummingbird, Stripe-cheeked Woodpecker, Beautiful Treerunner (Darien only), Yellow-green (Panamanian) Tyrannulet, Yellow-green Finch, Pirre Bush Tanager (Darien only and probably also in Colombia) and Green-naped Tanager (Darien only and probably also in Colombia). (Coiba (Rusty-backed) Spinetail is endemic to the island of Coiba where it can be seen along the Hot Spring Trail, accessible by boat from Playa Arrimadero near Santa Catalina). Russet-crowned Quail Dove, Pirre (Rufous-cheeked) Hummingbird, Dusky-backed Jacamar, Varied Solitaire, Pirre Warbler and Viridian Dacnis. (Tacarcuna Wood Quail and Tacarcuna (Pale-throated) Tapaculo occur only on the Tacarcuna Ridge on the Panama/Colombia border, a tricky and potentially dangerous place to visit in 2015 when FARC terrorists from Colombia were believed to be present in the area). The Darien province also supports the highest known density of Harpy Eagles in the world, and yet they remain remarkably elusive in this remote region. Between the years 2000 and 2006 a total of 25 breeding pairs were located here, with four to six nests in every 50 square miles. 50 or so species shared with eastern Costa Rica including Fiery-throated Hummingbird, Magenta-throated Woodstar, Prong-billed Barbet, Fiery-billed Aracari, Black-faced Solitaire, Black-cheeked and Flame-throated Warblers, Zeledonia (Wrenthrush), Collared Redstart, Black-and-yellow and Long-tailed Silky Flycatchers, and Yellow-thighed Finch. Other specialities include Resplendent Quetzal, Rufous-crested Coquette, Snowcap, Violet Sabrewing, Blue Cotinga, (Broad-billed) Sapayoa, Yellow-collared Chlorophonia, and Blue-and-gold and Grey-and-gold Tanagers. Also a chance of Great Green Macaw, Speckled (Spiny-faced) Antshrike, Black-crowned Antpitta/Gnatpitta/Pittasoma, Northern Royal Flycatcher, Three-wattled Bellbird, and Black-tipped and Turquoise Cotingas, and an outside chance of Crested and Harpy Eagles, Rufous-vented Ground Cuckoo and Bare-necked Umbrellabird. Keel-billed and Chestnut-mandibled Toucans, Golden-headed Quetzal, trogons, Broad-billed, Rufous and Tody Motmots, hummingbirds including Purple-crowned Fairy, Great and Rufous-tailed Jacamars, and Golden-collared, Golden-headed, Lance-tailed and Red-capped Manakins, as well as Magnificent Frigatebird, Grey-headed Chachalaca, Crested Guan, Rufescent Tiger Heron, Boat-billed and Cocoi Herons, King Vulture, hawks including White, Ornate Hawk Eagle, Red-throated Caracara, (American) Swallow-tailed Kite, White-throated Crake, Northern and Wattled Jacanas, pigeons and quail doves, parakeets, parrots, Amazon, Green and Ringed Kingfishers, puffbirds, Grey-cheeked Nunlet, White-fronted Nunbird, Red-headed and Spot-crowned Barbets, Yellow-eared Toucanet, Collared Aracari, woodpeckers, Double-banded Greytail, Buffy Tuftedcheek, foliage-gleaners, woodcreepers, antshrikes, antwrens, antbirds including Bare-crowned, Bicoloured, Ocellated and Spotted, antthrushes, Spectacled Antpitta, tyrant flycatchers including Black-capped Pygmy Tyrant (the smallest passerine bird in the world along with Short-tailed Pygmy Tyrant), Sharpbill, Rufous Piha, Purple-throated Fruitcrow, becards, Black-crowned and Masked Tityras, Green and Yellow-browed Shrike Vireos, Black-chested Jay, wrens, Long-billed Gnatwren, nightingale thrushes, wintering warblers including Golden-winged and Blackburnian, Blue and Scarlet-thighed Dacnises, honeycreepers including Shining, tanagers orioles, caciques, oropendolas and euphonias. Also a chance of Red-billed Tropicbird, Sunbittern, Sungrebe, owls and Great Potoo. Hoffmann's Two-toed and Brown-throated Three-toed Sloths, Geoffroy’s (Red-naped) Tamarin, Mantled Howler, Grey-bellied (Lemurine) Night, Central American (Brown-headed) Spider and White-faced Capuchin Monkeys, (Lesser) Capybara (near Gamboa Rainforest Resort), White-nosed Coati, Central American Agouti, Olingo, Central American Woolly, Common and Grey Four-eyed Opossums, and Orange Nectar Bat. Also a chance of Baird’s Tapir, Humpback Whale (mostly May-Nov, Coiba NP), Bottlenose and Pantropical Spotted Dolphins, Kinkajou and Greater Bulldog (Fishing) Bat. The endemic Pygmy Three-toed Sloth occurs only on Isla Escudo de Veraguas, east of Bocas del Toro off the north coast. Excellent scuba-diving and snorkeling, at places such as Bocas del Toro/Isla Bastimentos Marine National Park and Coiba National Park where there are Manta Ray and turtle cleaning stations. On the mainland lizards include Striped Basilisk. Metropolitan Park, Panama City Slaty-tailed Trogon, Whooping Motmot, Yellow-green Tyrannulet, Lance-tailed Manakin, Rosy Thrush Tanager and Geoffroy's Tamarin. Soberania NP including Canopy Tower on Semaphore Hill, Pipeline Road, Rainforest Discovery Center (with tower) and Gamboa Rainforest Resort and area Boat-billed Heron (nesting at Summit Ponds/Old Gamboa Road), Tiny Hawk, Slaty-backed Forest Falcon, trogons, Rufous-crested Coquette, Broad-billed and Whooping Motmots, Great Jacamar, puffbirds, Chestnut-mandibled and Keel-billed Toucans, woodpeckers, antbirds including Spotted, Spectacled Antpitta, Purple-throated Fruitcrow, Blue Cotinga, Rufous Piha, Golden-collared and Red-capped Manakins, Green Shrike Vireo, Hoffmann's Two-toed Sloth, Geoffroy's Tamarin, and Central American Woolly and Common Opossums. Also a chance of Sunbittern, Crested and Spectacled Owls, Rosy Thrush Tanager and Grey-bellied Night Monkey, and an outside chance of Rufous-vented Ground Cuckoo. Cerro Azul Purplish-backed Quail Dove, Rufous-crested Coquette, Violet-capped Hummingbird, Rufous Motmot, Keel-billed Toucan, Yellow-eared Toucanet, Stripe-cheeked Woodpecker, Blue Cotinga, Red-capped Manakin, Scarlet-thighed Dacnis, Shining Honeycreeper and Mantled Howler. Also a chance of Black-eared Wood Quail. San Francisco Private Reserve Black-crowned Antpitta, Bicoloured, Ocellated and Spotted Antbirds, and Blue Cotinga. Nusagandi Sapayoa, Dull-mantled Antbird and Red-capped Manakin. Also a chance of Olive-backed and Purplish-backed Quail Doves, Speckled Antshrike and Black-crowned Antpitta. Cerro Jefe Violet-capped Hummingbird, Stripe-cheeked Woodpecker and Black-and-yellow Tanager. Also a chance of Black-eared Wood Quail. El Valle de Anton Area including Canopy Lodge, La Mesa (Candelaria Trail) and Los Altos del Maria Grey-headed Chachalaca, Grey-necked Wood Rail, White-tipped Sicklebill, Broad-billed, Rufous (at bird feeders) and Tody Motmots, Collared Aracari, Spot-crowned Barbet (La Mesa), Streak-chested Antpitta, Black-chested Jay, Scarlet-thighed Dacnis, Hoffmann's Two-toed and Brown-throated Sloths, and Central American Woolly, Common and Grey Four-eyed Opossums (at bird feeders at night at Canopy Lodge, with Orange Nectar Bats on hummingbird feeders). Also a chance of Crested Owl, Rufous-crested Coquette, Snowcap, Crimson-bellied Woodpecker, Black-crowned Antpitta, Rosy Thrush Tanager and Kinkajou. Cerro Chucanti NR Tacarcuna Bush Tanager, Beautiful Treerunner, Varied Solitaire, Great Curassow and Ocellated Antbird. Also a chance of Russet-crowned Quail Dove, Brown-billed Scythebill and Black-crowned Antpitta. Meteti Area Red-rumped Woodpecker, Double-banded Greytail, Black Antshrike, White-headed Wren and Black Oropendola. Aligandi Area Great Green Macaw. Canopy Camp including nearby El Salto Road and Yaviza White-throated Crake, Spectacled Parrotlet, Barred Puffbird, Sooty-headed Tyrannulet, Double-banded Greytail, Golden-collared (lek) and Golden-headed (lek) Manakins, Black Oropendola (near Yaviza), Brown-throated Sloth and Mantled Howler. Also a chance of Harpy Eagle, Black-and-white and Striped Owls, and Dusky-backed Jacamar nearby. Rancho Frio (by foot from El Real) Semi-plumbeous Hawk, Golden-collared Manakin, Scarlet-browed Tanager and Viridian Dacnis. Also a chance of Crested Eagle and Black-tipped Cotinga. Rancho Plastico (by foot from Rancho Frio) Tody Motmot, Wing-banded Antbird, Yellow-browed Shrike Vireo and Geoffroy's Tamarin. Cana, Darien NP Grey-cheeked Nunlet, Bare-crowned Antbird, Spectacled Antpitta, Sapayoa, Blue Cotinga, Golden-collared Manakin, Yellow-browed Shrike Vireo and Viridian Dacnis. Also a chance of Rufous-crested Coquette, Tody Motmot, Dusky-backed Jacamar, Black-crowned and Fulvous-bellied Antpittas, Black-tipped Cotinga and Baird's Tapir. Cerro Pirre, camping at 1100 metres, Darien NP Black-eared Wood Quail, Russet-crowned Quail Dove, Golden-headed Quetzal, Pirre and Tooth-billed Hummingbirds, Greenish Puffleg, Violet-throated and Yellow-eared Toucanets, Beautiful Treerunner, Sapayoa, Sharpbill, Rufous Piha, Varied Solitaire, Pirre Warbler, Green-naped Tanager, Pirre Bush Tanager, Yellow-collared Chlorophonia and Grey-and-gold Tanager. Also a chance of Great Green Macaw. Cerro Punta Area Resplendent Quetzal, Violet Sabrewing, Black-cheeked and Flame-throated Warblers, Collared Redstart, Zeledonia, Black-and-yellow and Long-tailed Silky Flycatchers, and Golden-browed Chlorophonia. Volcan Baru NP Area including Los Quetzales Trail Black Guan, Resplendent Quetzal, Fiery-throated, Scintillant and Stripe-tailed Hummingbirds, Fiery-billed Aracari, Prong-billed Barbet, Black-cheeked and Flame-throated Warblers, Wrenthrush, Collared Redstart, Spangle-cheeked Tanager, Black-and-yellow and Long-tailed Silky Flycatchers, and Large-footed and Yellow-thighed Finches. Also a chance of Black-breasted and Spotted Wood Quails, Maroon-chested Ground Dove, Buff-fronted Quail Dove, Three-wattled Bellbird and Silvery-throated Jay. Finca Hartmann, Santa Clara Blue-diademed Motmot, Fiery-billed Aracari, Red-headed Barbet, Pale-billed Woodpecker and Turquoise Cotinga. Also a chance of Spotted Wood Quail and Chiriqui Quail Dove. Cerro Santiago Prong-billed Barbet, Buffy Tuftedcheek, Black-cheeked Warbler, Zeledonia, Black-and-yellow Silky Flycatcher and Tacarcuna Bush Tanager. Isla Bastimentos Red-capped Manakin. Also a chance of Three-wattled Bellbird (November), Stub-tailed Spadebill and Woolly Opossum. Humedal de San San Pond Sak Bare-throated Tiger Heron, all six American kingfishers, Keel-billed Toucan, White-collared Manakin and Nicaraguan Seed Finch. Swans Cay (accessible only in suitable weather) Red-billed Tropicbird colony. Isla Popa A chance of Snowy Cotinga. La Fortuna FR (on nearby mainland) Black Guan, Sulphur-winged Parakeet, Purple-throated Mountain-gem, Prong-billed Barbet, Golden-bellied Flycatcher, and Blue-and-gold, Silver-throated and Spangle-cheeked Tanagers. Also a chance of Snowcap and Three-wattled Bellbird (November). Changuinola area (on nearby mainland) Band-backed, Black-throated and Canebrake Wrens, Passerini's Tanager and Nicaraguan Seed Finch. The wettest season usually lasts from mid-April to December hence the best time to visit is between January and March, although any time between October and March is good for birds, with April being the best time for Darien. The Birds of Panama: A Field Guide by G R Angehr and R Dean. CUP, 2010. Guide to the Birds of Panama by R A Ridgely and J A Gwynne. PUP, 1992 (Second Edition). A Bird-Finding Guide to Panama by G R Angehr, and D and L Engleman. Comstock, 2008. Helm Field Guides: Birds of Costa Rica by R Garrigues and R Dean. Helm, 2014 (Second Edition). An Illustrated Field Guide to the Birds of Costa Rica by V Esquivel Soto. Incafo, 2008 (Second Edition). A Field Guide to the Mammals of Central America and Southeast Mexico by F A Reid. OUP, 2009 (Second Edition). A Swift Guide to the Butterflies of Mexico and Central America by J Glassberg. Sunstreak Books, 2007. National Audubon Society Field Guide to Tropical Marine Fishes by C L Smith. Alfred A Knopf, 1997. Where to watch birds in Central America & the Caribbean by N Wheatley and D Brewer. Helm, 2001. Don’t know which country/countries/regions to visit in Central America? Then it may be worth considering taking a look at this book, written by this website’s author and David Brewer. It is many years old of course but it still provides a starting point, an overview and a guiding light to the best birds and the best places to look for them in the region, and could save hours of searching for similar information on the internet. However, it is important to check more up-to-date sources for sites which have been opened up, sites and species which have been discovered, lodges that have been built etc. since the book was published. Many trip reports, some for Panama, are posted on the websites listed here. On some of these websites some reports are independent and some are posted by tour companies who organize tours to Panama. These tour companies and others also post their own reports on their websites, which are listed under 'Some Organized Tours to Panama' below. Tour companies who are running organized tours to Panama in the next couple of years include the following. Many of these also offer custom tours.